Many businesses are looking for ways to increase the speed and efficiency of supply chain production while also maximizing profits. Transportation companies play an important role in helping achieve that goal. However, the freight industry is growing concerned that certain acquisitions could threaten the ability to provide customers with the level of service needed. For example, although FedEx Corp. and United Parcel Service Inc. are competitors, the two have found common ground on one issue: the possible merger between Norfolk Southern Corp. and Canadian Pacific Railway Ltd. This week, The Wall Street Journal reported that the delivery giants are against the rail companies joining forces because it would result in increased shipping costs and reduced services. In a letter sent last month to the United States Surface Transportation Board, FedEx Freight Corporation explained that it is strongly opposes the acquisition proposal Canadian Pacific made to Norfolk Southern because the less-than-truckload companies rely on Class I rail services to provide customers with cost-effective shipments. It also said that the merger would cause budget cuts for intermodal operations and that "such an erosion of competition would ultimately adversely impact the American consumer and our still somewhat fragile economy." This correspondence is very similar to the one sent earlier in February by UPS. 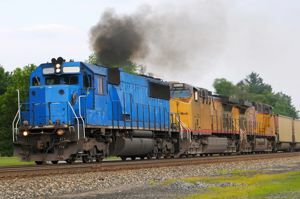 In its letter, the company explained that intermodal rail services are "critical in helping to alleviate highway congestion, promote air quality and mitigate highway infrastructure degradation" and that allowing the merger would negatively impact the shipping and transportation community. According to The Wall Street Journal, this is not the only effort Canadian Pacific has made to integrate rail businesses. Although so far unsuccessful, over the past couple of years the company has made several bid attempts for CSX Corp. The news source also added that Canadian Pacific Chief Executive Hunter Harrison is adamant about the offer made to Norfolk Southern for approximately $30 billion. However, Norfolk has not yet accepted because it believes the bid should be higher and that there are still regulatory issues. Using both trucks and rail for container shipping is a strategy that both UPS and FedEx depend on to make thousands of deliveries every day. And these companies are not alone in their opposition. The Wall Street Journal also revealed a range of associations in the manufacturing, automotive and agricultural fields are against the merger as well. Ultimately, though, the decision is up to the Surface Transportation Board. And the decision is not an easy one to make considering this is the first significant merger between rail operators that has been proposed since 2001, when strict policies were enforced, the Associated Press revealed. The source also added that, earlier this week, Canadian Pacific called on the regulators to release a declaratory order confirming its views on the voting trust structure for the bid. The company hopes that obtaining this information will help put Norfolk Southern investors at ease. If the deal is approved, it will likely impact both the speed and cost of shipments for companies, as well as American consumers.